Currently most cancers are diagnosed at late stages when the disease has become unresectable and incurable. Developing non-invasive blood-based tests is extremely appealing for presymptomatic screening and early detection of cancers where obtaining tissue biopsy is highly invasive and costly. Probing circulating exosomes becomes an emerging paradigm for cancer detection and monitoring response to treatment. Most eukaryotic cells release exosomes that are membrane vesicles derived from the endolysosomal pathway with a size range of ~30-150 nm. Exosomes play important biological roles via transfer of cargo consisting of proteins, RNAs,and mitochondrial DNA. 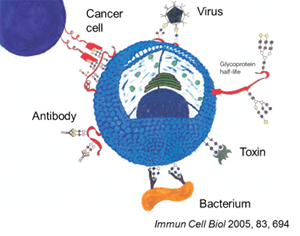 Exosomes have been found abundant in blood and malignant effusions derived from various cancers. The constitutive release of exosomes with selectively enriched biomolecules presents distinctive opportunities for probing tumor biology and cancer diagnosis in a non-invasive manner, i.e., liquid biopsy. 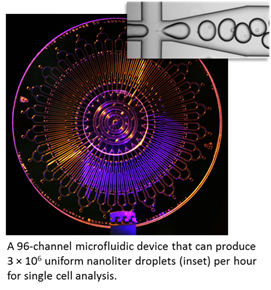 Our research aims to develop novel functional materials and microfluidics-based assays for efficient isolation and quantitative molecular profiling of circulating exosomes in cancer. 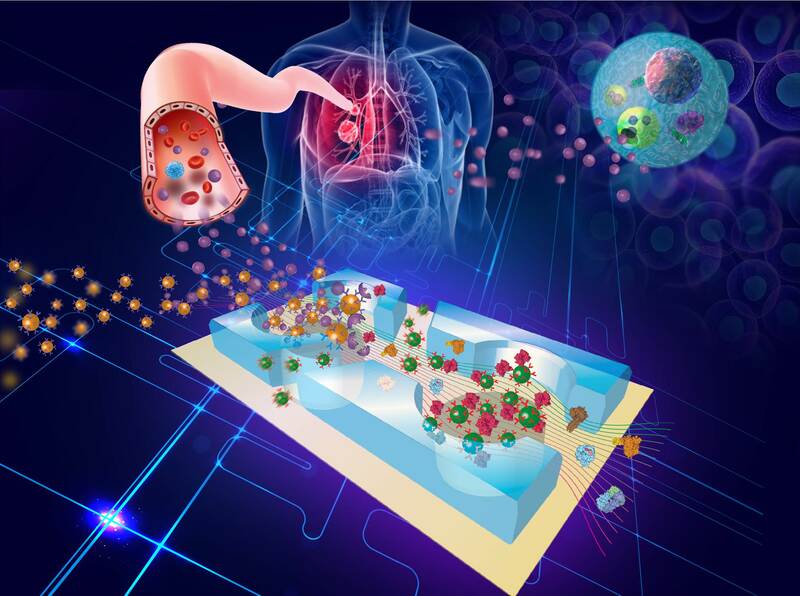 These new analytical capabilities would accelerate the studies of the potential applications of these specialized structures in biomedical sciences and personalized cancer treatment. Cancer is a complex genetic disease that derives from single cells gradually accumulating mutations. Early stage carcinogenesis has been challenging to study due to the lack of tools capable of quantitative detection and molecular characterization of low frequency mutations. Most current molecular biology methods examine an ensemble average across a large number of cells despite the remarkable molecular heterogeneity of tumor cells. So the ability of molecular analysis with single cell sensitivity and resolution is imperative for a better understanding of cancer biology and for improving clinical medicine. Single cell analysis represents a new frontier in biology and medicine. 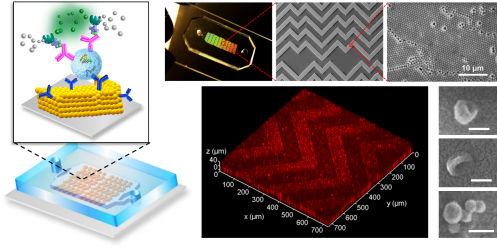 Our research in this field focuses on developing high-throughput microfluidic technologies that enable quantitative single cell analysis of genotypic and phenotypic changes associated with cancer at the systems level. We are particularly interested in applying the new technologies to interrogating rare cancer cells of clinical significance, such as minimal residual disease (MRD) responsible for disease recurrence and circulating tumor cells (CTC) associated with metastasis. Protein glycosylation is ubiquitously involved in all aspects of tumor development. While glycoproteins and their carbohydrate modifications (glycans) show great potential for cancer diagnosis and prognosis, progress of glycobiology and clinical utility has been largely hindered due to the complexity of glycome, dynamic nature of glycosylation changes, and the lack of efficient analytical tools. 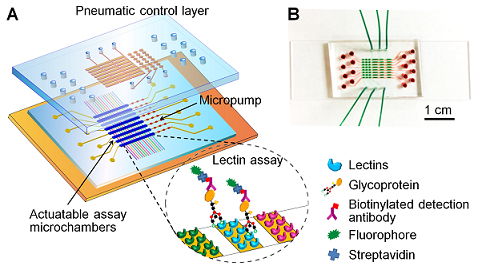 In response to these challenges, our group is interested in exploiting microfluidic platforms to leverage the performance of glycoproteomic and glycomic analysis. Our short-term goal is to develop high-throughput glycomic profiling technologies that enable sensitive quantitation of glycoproteins of interest, structural analysis of glycans, and dynamic mapping of disease-associated glycosylation aberrations using minute blood samples. We are committed to establishing cross-disciplinary collaborations to address the long-term goal-- development and clinical validation of glyco-biomarkers and diagnostic devices for early detection of cancer and cancer risk. Rapid advent of life science and global health care calls for the development of novel bioanalytical methodologies and high-performance affordable diagnostic devices. Nanoscale materials, such as nanoparticle and nanowire, are well suited to address this need due to their unique chemical and physical properties. Most of these designer materials, however, are not amenable to monolithic device integration, which significantly restricts their biomedical applications. Our research in this area is oriented to explore novel programmable nanomaterial self-assembling techniques and to develop nanomaterial integrated microsystems for high-performance analysis of small molecule drugs, metabolites, and biomarkers. The applications we are interested in encompass forensics, pharmaceutical analysis, and public health care such as point-of-care (POC) diagnostics.